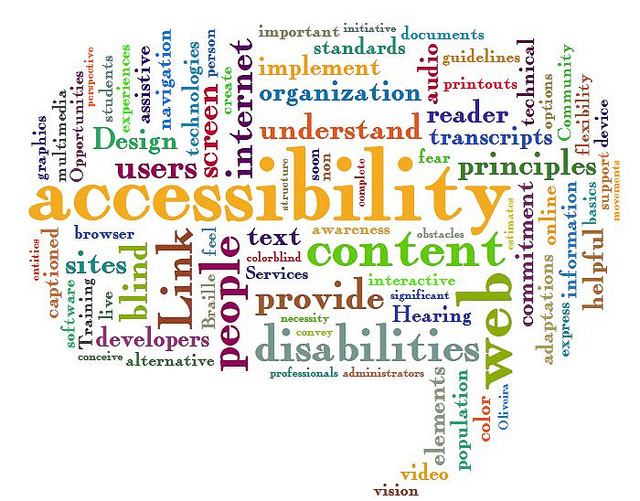 "web accessibility word cloud" by Jil Wright. 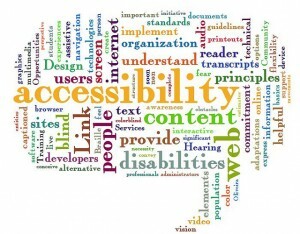 May 15th was Global Accessibility Awareness Day. As someone who spends a lot of time in online courses personally and professionally, I decided to take advantage of a free webinar entitled “Web Accessibility Tools in Action: Awesome Tools to Build The Web For All” offered by Desire2Learn. Sean Yo (@seanyo or seanyo.ca for more information on him) presented the webinar, as was a very engaging speaker. Although I expected the webinar to focus more specifically on accessibility in Desire2Learn, Sean spoke more generally about accessible design. There was a discussion about how to think about accessibility that I really enjoyed. Nothing is ever 100% accessible, and you should expect to make continual improvements to the accessibility of your material, the same way you would refresh your content year after year. I feel that thinking of accessibility that way puts up less of a barrier to tackling accessible design – you don’t have to be perfect, you just need to be willing to continually improve. The presentation was geared towards tools and resources, many of which are new to me. I collected most of the resources and tools mentioned in the webinar into a Diigo list here: https://www.diigo.com/user/boychuks/accessibility?type=all&sort=updated if you are interested in reviewing it. There are tools that emulate screen readers, tools to check the readability of your text and tools to review your webpages for accessibility. There are also a couple of suggested books. Sean also wrote a blog post about Global Accessibility Awareness Day here: http://www.desire2learn.com/blog/make-global-accessibility-awareness-day/. The biggest take-away from both his presentation and blog, I think, is empathy. It is easy to forget how challenging accessing the online world can be for people with disabilities. My breakthrough moment came later last year when a student who uses a screen reader came into the Centre for Innovation and Excellence in Learning (CIEL) office for support. They were experiencing a complicated issue, further complicated by having to scroll through their own system and the online course using a screen reader. This experience really opened my eyes (so to speak) to how the web “looks” for people with visual impairments. Using some of the tools presented at the webinar, I have gone back and looked over some of the things I have created personally and as a member of the CIEL team. There is plenty of room for improvement, and I will be doing my best to adapt and change my work, now and in the future.